Repair the binding, lose the map? I am in a quandary. I have a treasured copy of Publii Terentii Afri Comoediae (The plays of Terence) printed and published by John Baskerville in 1772. The book is a fine example of Baskerville’s later design and printing (he died in 1775), the text is laid out generously, printed of course in his own Baskerville types on the characteristic laid paper, smoothed or pressed after printing. The binding is a contemporary full brown calf with faint traces of a diced or cross-hatched pattern, with gold rules to the front, back, edges and insides of the boards and spine, and blind tooling on front, back and spine. An attractive decorative tool is used between raised bands on the spine. All in Good Time the autobiography of watchmaker George Daniels (designed, printed and bound by DE) is part of the Guild of Book Workers national touring exhibition, Marking Time. I am pleased to announce my special binding of The Prelude by William Wordsworth is now available. The cover design is based on a detail from the same watercolour that was used for the fourteen illustrations. Other details form doublures and flyleaves. Bound in white alum-tawed goatskin, the book is hand-sewn on linen tapes, with hand-sewn, two-colour headbands and leather-jointed end leaves. It is presented in a felt-lined drop-back box together with an extra set of the illustrations, including one not printed in the book. 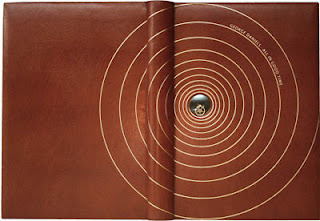 Designed, printed and bound by David Esslemont. 380 pp., 290 x 185 mm. 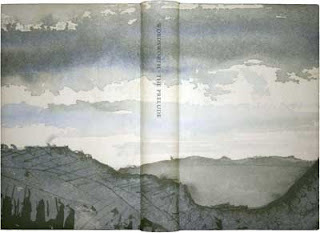 Set in Adobe Bembo and printed on Zerkall mould-made paper in an edition of 200 copies. Fourteen illustrations are archival inkjet prints. Published in 2007 by the Wordsworth Trust. Getting side-tracked from the Florilegium I have created Heads, a book for children (or the child in all of us). To be published under a new imprint: Moles Nest Books. 28 pp, 8.5 x 8 inches, hand-sewn, fifty copies. "Heads is a collection of pen-drawings made by British artist David Esslemont. A simple line is used to create various characters and expressions from the sublime to the ridiculous. Contortions and deformations arise with sometimes shocking brutality and absurd humour. Overall the drawings reveal the artist’s sharp and observant eye as he records the subtlest of details." The apples are developing some interesting character. The skins now resemble a dried chili pepper while the flesh is dessicating to reveal ten-pointed nodes. I have just found a long-lost notebook of drawings of heads I made many years ago. These pen drawings will be published as a small book to amuse the reader on these long, cold winter days . . . if you respond with enthusiasm! 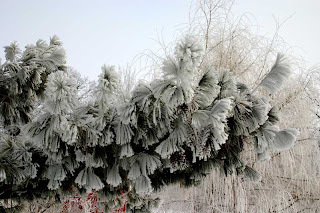 It is winter and there are no fresh deciduous leaves to print on the trees, so I turned to fruit. Image capture was a straightforward high-resolution scan. 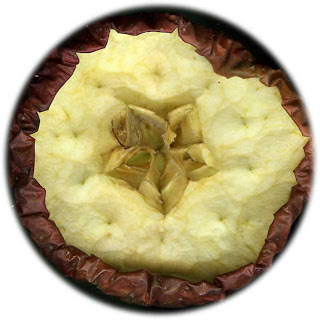 I chose the apple because it's gynoecium [the female reproductive organs] are a five-pointed star or pentagram. This was of particular interest following the hexagon experiments as the points of the star define another geometric figure, the pentagon. Euclid describes how to construct a pentagon in Book IV, Proposition 11. 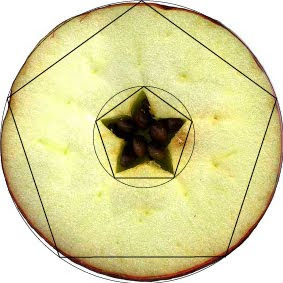 It is interesting to note how the cross-section of the apple is almost perfectly circular. Experimenting with a square detail from the blackberry leaf I discovered the Café Wall optical illusion, and created a snow crystal. This reminded me of a tiled floor I first saw in a church in Italy and prompted me to re-create the pattern using the leaf on a parallelogram. 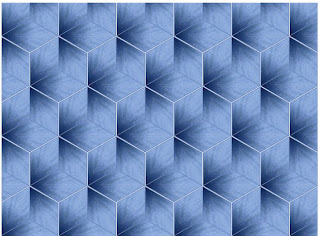 The pattern is a tessellation of parallelograms. The parallelogram is constructed from two equilateral triangles and is also known as an equilateral quadrilateral or rhombus. 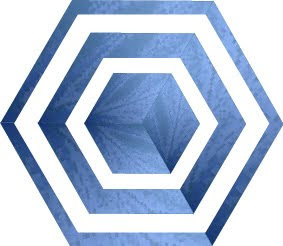 Three rhombi form a hexagon. So the floor pattern is also a tessellation of hexagons. Giving each rhombus a distinct colour emphasises the illusion of three-dimensional cubes. Patterns such as this, based on symmetry, belong to the Wallpaper Group (or Plane Symmetry Group or plane crystallographic group). Apparently, there are 17 distinct groups; and this pattern would appear to belong to Group p6m. Water molecules in an ice crystal form a hexagonal lattice – a simple snowflake. The elaborate six-armed symmetry of snowflakes is derived from this ice crystal lattice.